Have you been trying to find high-quality turf for your property site? Look no further than Abbey Turf; we are the best turf suppliers in Hampshire. At Abbey Turf, we are trusted by Local Authorities and Governments alike for when they need superior turf, so we can promise that you won’t find a better supplier for luxurious turf in all of Hampshire. At Abbey Turf, we believe in always growing turf that is weed free, as well as chemical free. Our team enjoy growing beautifully green turf and we never cut any corners by buying turf from another company and then selling it on to you, pretending it’s our own creation. 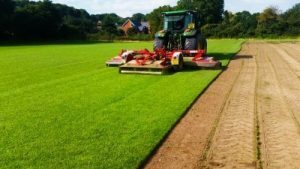 When you hire Abbey Turf as your turf suppliers in Hampshire, you can be confident that you’ll have the finest turf delivered to your property, and that is has been grown with love and care for its well being. All of the turf that we create at Abbey Turf is produced in-house, and we use our tried and tested method that we have perfected over our 25 year career in the industry. To make our turf, we use the very best turf seeds that are available on the market in the UK, and then plant these seeds into sandy soils that are of the uppermost purity. Our sandy soil method allows for a healthy start to your turfs life, and we continue this nourishment through the food we feed your turf. In order to not harm your turf as it is growing, we don’t put any netting over the top of the turf, which other turf companies like to do in Hampshire. During our 25 years as Abbey Turf, we have expanded the size of our operation from an understated 10 acre plot of land, into the incredible 180 acres of turf that we are proud to call our own today. The largeness of our acreage means that we can always get the amount of requested turf to your property within 24 hours of your request; as we make sure to always have a constant revolving process of producing turf. To see examples of the high-quality turf that we have laid in Hampshire properties, including domestic and commercial buildings, view our gallery. When you are looking for the best turf suppliers in Hampshire, make sure you always choose Abbey Turf. Give a member of our team a call today on 02380 812302 for your free, no obligation quote, and we will transform your outdoor space with our attractive turf.